Châteauneuf du Pape is the largest and most important wine appellation in the southern Rhône. It was the first ever ‘Appellation Contrôlée’ established in France in 1932. 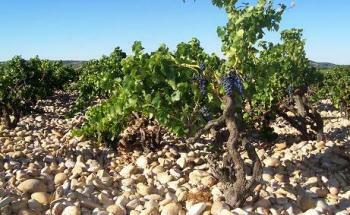 Domaine Grand Veneur is one of the most renowned estates of Châteauneuf du Pape. 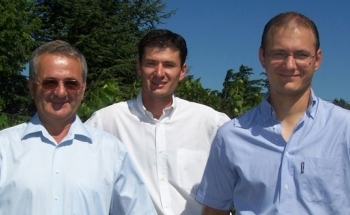 Alain Jaume, with his sons Stéphane and Christophe, run this well-established estate near Orange. The Grand Veneur range comprises an extremely impressive red and white Châteauneuf-du-Pape and Côtes du Rhône Reserve Red. The white wines have improved year on year due to a greater understanding of the use of oak in wine. Alain Jaume has produced a very unusual 100% Roussanne (white Rhône variety) Châteauneuf du Pape Blanc “La Fontaine”. This was made possible by the adoption of modern vinification techniques, like cold fermentation and meticulous data collection. Alain Jaume destems all the red grapes to avoid rusticity in the wines. The red Châteauneuf-du-Pape “Les Origines” is a benchmark for the modernist approach. Tell-tale new American oak now supports the fruit. Improvements have been quite noticeable. New techniques have been used and old ones, such as not filtering the wines. Robert Parker ‘The Wine Advocate’ has mentioned the vineyards and highly praised recent vintages. A world class wine producer!